(From Tamron lens literature) This lens employs an IF (Internal Focusing) system that maintains the overall length of the lens during focusing. Uses two LD (Low Dispersion) glass elements that effectively compensate for chromatic aberration. Provides high-contrast, outstanding image quality and a soft out-of-focus background effect. Incorporates an AF/MF one touch switchover mechanism built into the focus ring (for Canon and Nikon only). Super performance series provides high performance through outstanding design specifications. Features the new FEC (Filter Effect Control) function that enhances operational ease of Polarizing Filter use. The new Filter Effect Control is designed to rotate the filter to the desired position while the hood is attached. This is accomplished by turning the FEC ring that in turn rotates the portion of the filter mount where the filter is mounted. I bought this lens in France new, just after it came out. Big mistake. After only 9 months the flimsy aperture mechanism gave up the ghost. The build quality is nothing like the 180mm 2.5 SP lens, which I also own. While I took a lot of lovely insect shots with it, the shifting was noisy and it was far more fiddly than the 200mm Micro Nikkor. I was even more frustrated when I worked out that the warranty has its pitfalls. If anybody wants to see my photos of the aperture linkage, please contact me. an excellent alternative for the legendary Nikkor 200/4 Micro. It simply does the same, for a fraction of the price. IQ is superb. sharp even wide open. well performer for portraits too. build quality is nice. sturdy tripod collar, equipped with long plastic hood. One of the downside is the AF, well it's AF like a tamron lens. not really convenience for actions, but it's a macro lens, not really designed for sports anyway. For the price, I think nothing more to complain about. if you find one, get one.. especially if Macro is your thing. I spent countless hours researching for a good macro lens and basically had it narrowed down to the Sigma 70mm, Tamron 90mm and 180mm. I read complaints about how close you have to get with the 70 or 90mm lenses and decided that any extra distance I could place between myself and shy animals and bugs would be nice (this lens is supposed to be able to focus at 18.5 inches). I am not sure if this is normal or typical of a macro lens, but I was able to focus at 10 inches. The lens arrived wrapped in a plastic bag (with small packet of desiccant) and placed in the provided lens pouch (and in the original box). I was glad to see it packaged this way because Amazon did a poor job filling the shipping box with plastic cargo pillows. The first thing I noticed immediately upon unboxing is the provided lens pouch is not made of neoprene but seems to be made from high quality nylon (possibly 600D or better) and about a 1/4 inch of extra padding was stitched around the entire pouch. I was happy to see this because I really don’t think neoprene offers much protection and I can’t stand the smell. The case is very well made and has a dual drawstring system to close the lens pouch. Also, it has a nice handle to make carrying easier. Unfortunately, there are no hooks, d-rings or loops to easily attach it to your bag or to attach a shoulder strap. This lens measures about 7.5 inches long with both end caps attached and about 3.5 inches in diameter. Of course, length and diameter will increase if you have the lens hood or tripod mount attached. BTW, the lens hood is huge (which is a good thing) but it will add an extra 4 inches to the length of the lens. I am using this lens with my Sony A57 and upon mounting it to the camera body I noticed it’s a little loose. This is something I find very common with Tamron lenses and is worth a 0.5 point deduction from the overall rating. No, the lens is not going to fall off and no, it’s not going to break any connection between the lens and the camera, but I think this is something that Tamron needs to address. I will say that this lens has much less movement than my 17-50 and 70-300 Tamron SP lenses. For the price, I would expect a more precise and tighter fit. This lens is made mostly of plastic, but does not feel cheap. The fit and finish is perfect and the large focusing ring is awesome! The focusing ring has a nice rubberized (and textured) band and rotates smoothly in MF mode. One thing I found odd (or at least very different than any other lens I’ve used) was the absence of a AF/MF switch. Instead, you need to grasp the focusing ring and pull it towards the front of the lens for AF or pull it towards the camera for MF. The ring locks in place nicely and should not move out of AF or MF unless you really want it too. AF performance is definitely lacking (as most reviewers indicated) but it does work and when it locks on, you get a perfect photo. I prefer to use MF because I find controlling the focal point to be much easier and faster. If you switch the lens to AF and the focus is not close, it will cycle through the entire focal range, but if you switch the lens and the focus is close, the lens may focus within a fraction of a second. It really depends on the environment, but overall, I found AF to be lacking and it usually cycles through the entire range which takes a few seconds. This is worth a 0.5 point deduction because it would be nice (in some instances) to have AF that works fast. At the font of the lens, there is another ring that allows for FEC (filter effect control). This allows you to very easily rotate a filter with the hood attached (otherwise you would need to remove the hood, rotate your filter and reattach the hood). I really like this feature (even though I don’t use filters) and anyone who uses filters can benefit from this quick and easy way to rotate their filter. The tripod mount is easy to remove/attach due to its hinged design. It fits in a predetermined groove and there are markings on the mount and on the lens itself so you can be sure your camera is square/level. I plan on keeping the mount attached to the lens most of the time because it’s comfortable to hold and can rest in the palm of my hand when taking photos without a tripod. I really enjoy taking photos without a tripod simply because I don’t have to lug it around and I almost always have a very steady hand. However, for macro shots, it’s nice to utilize the stability of a tripod because the slightest movement could cause your photos to turn out blurry or the area you thought was in focus could shift to another area of the image. This is the first lens I’ve used where I noticed this happening. I actually thought there was something wrong with the lens because I would MF an object and when I was ready to take the photo I would notice it was out of focus. Now that I know what is happening, I have been able to effectively correct this without a tripod. But by all means, if you have your tripod with you, use it. Before I forget, I should mention that this lens features internal focus. This means that the lens barrel does not physically extend or contract when focusing (unlike your typical zoom lens). This feature is nice and can greatly reduce the amount of dust that is capable of making its way into the lens. So far, I’ve just been able to test the lens on inanimate objects inside my home as we are preparing for winter and it’s just too cold outside. I will be taking a trip to the southwest very soon and hope opportunities for some great outdoor macro shots will be presenting themselves. Overall, this lens is great. Optical quality is top notch and so far I have not experienced any issues such as chromatic aberration, vignetting or distortion. An indication of how good a lens is can be judged by how many are available for sale as used. 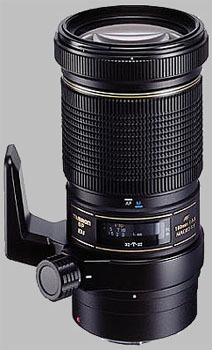 This is a tough lens to find for sale 2nd hand. Folks that purchase this Tamron keep it. It's excellent constuction and surperb image reproduction make it a time honored classic. Whether its used for macro at f/32 or sports photography at f/3.5 this is a can't miss performer. As far as I have seen, the picture quality is excellent. The only reason I refrained from giving 10 is that I have not checked the sharpness sufficiently for that - it has been enough for me. The bokeh is nice enough as are the colours. Using this lens for macro is a pleasure. The AF/MF switching is by the huge manual focus ring. It is easy, but USM-type override would be even better. There rotates enough for accurate focusing if you don't want to move the camera. As a normal tele the AF behaviour is not as nice. It is fast enough if the focus is found immediately, but if that misses you are in for a long wait. There is no focus limiter switch and that really shows. The build is plastic, but that is not entirely a bad thing. The lens is quite light and easy to carry around for a whole day if necessary. The construction also seems quite tight - the only play is in the filter effect ring. The down side of plastic is in the wear resistance - the barrell scratches a bit too easily. On the other hand, it certainly seems strong enough. This was tested the hard way by falling on asphalt with a camera hanging from my neck. The lens hit first and the UV filter frame was slightly bent. There was no change in lens performance. The filter effect ring can be a problem with macro flashes. It moves very easily and there is no way to lock it. Also, the tripod collar works, but it could be stiffer. All in all, this is a good lens, but not entirely without quirks.